I am long overdue in sharing this Quinoa Banana Oat Muffins recipe. I have been making these muffins for the past year and every time I post a photo of these on Instagram or my facebook page people ask for the recipe. I didn’t have a recipe to share because I was just making them up as I went and they turned out slightly different each time. 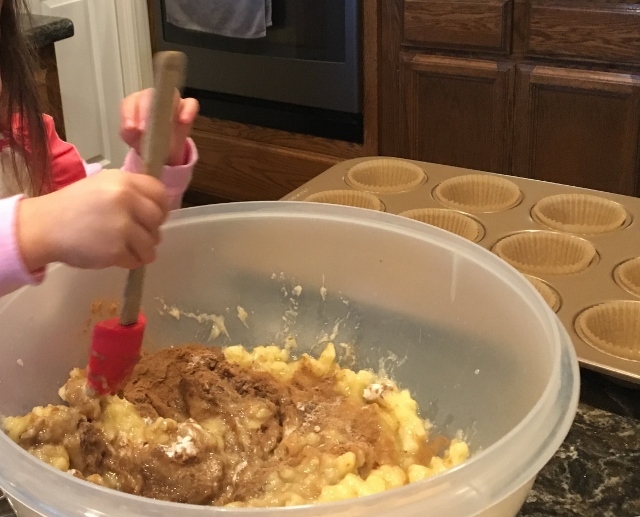 Our granddaughter little Sweet Pea loves to make muffins with me. When she spends the night the first thing she says in the morning is “Lita, I need my apron – I want to cook!” So we make a batch of these muffins. She loves to help stir and taste test! Since they are not made with flour these are a dense muffin that is hearty, filling and delicious. I learned from Chef AJ how to make muffins without flour, oil or sugar that still taste delicious. Our little Sweet Pea would want those muffins but she would just pick out the chunks of fruit in them and leave the rest behind. I felt like she was waisting the muffin and not benefiting from the nutrition of the oats. So I set out to make a flour, sugar, oil free muffin that she would eat. I made many batches of muffins before I settled on this combination of ingredients. Everyone in my family enjoys these muffins including Sweet Pea! We hope you enjoy the video. Please subscribe to my Nutmeg Notebook You Tube Channel so you will always see the newest video. These muffins are moist without being mushy. The oats do break down somewhat when combined with the wet ingredients. and they make you think there is flour present. The baking powder helps them rise just a little and improves the texture. The spices add a pleasant sweetness. They are good warm or cold with a big mug of hot herbal tea. These muffins freeze well. We take them with us when we travel, go hiking, bike riding, day trips and so on. When our daughter was in the hospital recently after giving birth to twins I took some of these muffins to her everyday. They are super filling and nutritious. This brand of vanilla powder is out of stock right now but I link to another brand down below. 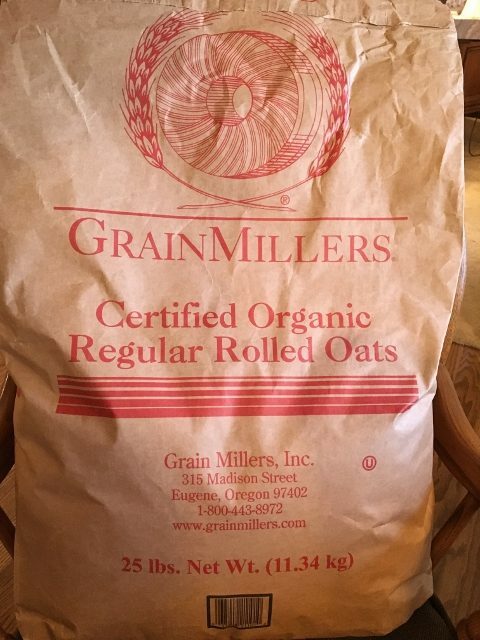 This is the brand of organic rolled oats that we buy at Winco Foods. 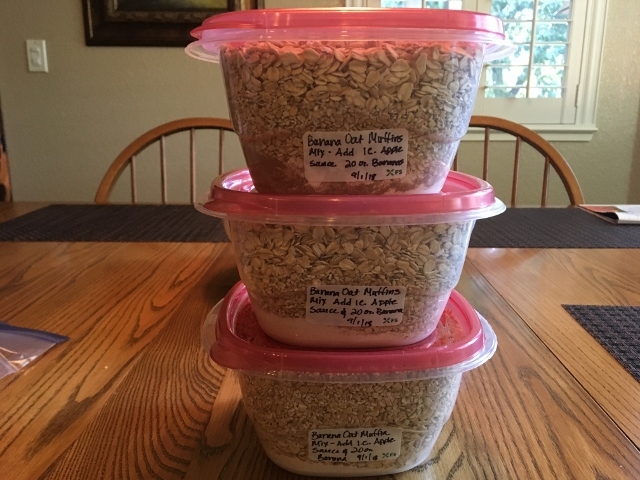 Hubby Tom eats oats for breakfast everyday so between his use and the things I make with oats we go through a lot of oats each month. He divides the oats up into gallon size bags in our Food Saver and then freezes the bags for future use. It is important to purchase pre-washed quinoa for this recipe so it can be made into a powder to add to the muffin mixture. Quinoa is a seed not a grain and is a high quality source of plant protein and fiber. 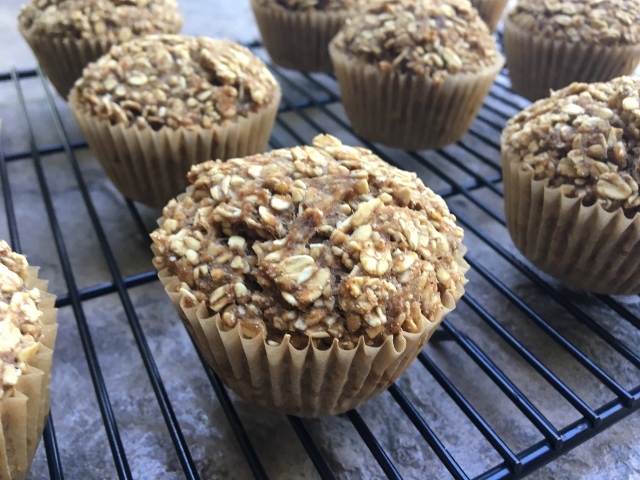 I wanted to make the muffins more nutritious for our granddaughter “Sweet Pea” so I include the quinoa powder and ground flax meal. She has no idea these muffins are good for her – she just knows they taste good! I use these parchment baking cups in my nonstick muffin pans. If you have silicone muffin pans you can use those. Sweet Pea likes to bake! Get the kids or grandkids involved in cooking in the kitchen- they really do like to help and it makes them want to try the food! Like I showed you in the video I like to make up my own Muffin Mixes. If I have all the ingredients out it just makes sense to go ahead and measure out the ingredients into more containers to use later. I label each container and include the amounts of wet ingredients to add when I am ready to make muffins. It is such a time saver. I also keep a stash of over ripe bananas in the freezer so I can always whip up a healthy muffin or other treats. I hope you enjoy these muffins as much as my family does. If you follow Chef AJ’s Ultimate Weight Loss program these muffins are compliant on her program. I will be working on some muffin variations in the future. 1/2 cup prewashed quinoa -dry – uncooked ground into a powder – see video – if you can’t find prewashed quinoa try using millet instead. In a large bowl mash the bananas using a potato masher or a large fork. Mix in the applesauce. Add the cinnamon, baking powder, cardamom, nutmeg and vanilla powder or vanilla extract. Stir until well incorporated. Add the quinoa powder, quick cooking steel cut oats, old fashioned oats and ground flaxseed meal. Stir until well combined. If using metal muffin tins use baking cup liners to prevent sticking or use silicone muffin pans. Using a 1/2 cup measuring cup divide batter evenly into 12 muffin cups. Bake for 30-35 minutes – depending on your oven. They take 30 minutes in my Breville Smart Oven Air on the bake function. Let cool completely. May be frozen for future use. Note: To make these Gluten Free be sure to buy gluten free oats. 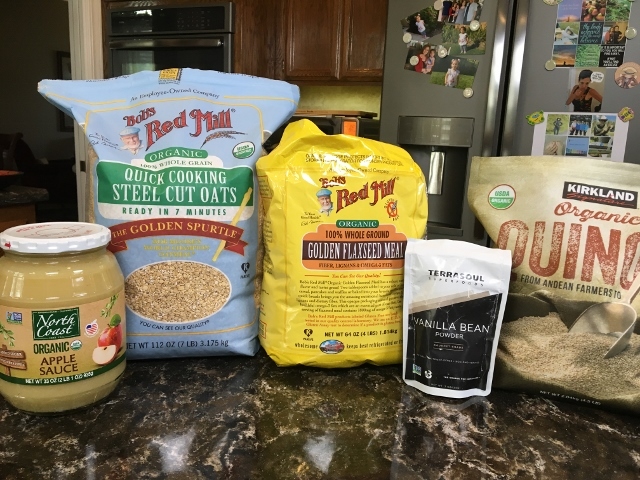 * Some people have told me that they use the regular steel cut oats but first they put them in their food processor and using the pulse function they cut the steel cut oats smaller – which is what is done to make quick cooking steel cut oats. So give that a try if you can’t find the quick cooking steel cut oats. 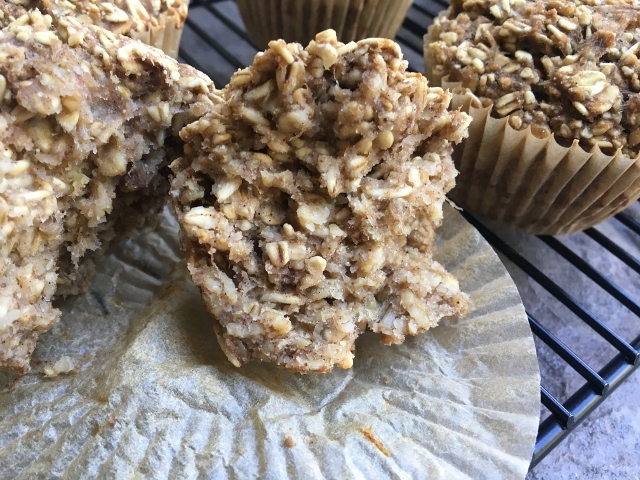 Variation: Pumpkin Quinoa Banana Oat Muffins – Sub 1 cup unsweetened canned pumpkin puree for the applesauce and add 1 tablespoon Pumpkin Pie Spice in addition to the spices in the original recipe. When you purchase items through my affiliate links you help support the work here on Nutmeg Notebook without any additional cost to you. Thank you for your support! These sound delicious. Must give them a try. (Love your haircut, by the way). Thank you so much! I hope you enjoy the muffins as much as we do! They look great, Thank you! The video was great. Thanks for posting it and all the links. When can we expect the video on your pancake recipe? It would be great to have a healthy recipe for this treat and your recipes are alway delicious and easy! I hope to get the pancakes recipe up soon! Do you store the “premixed” ingredient containers in the freezer, refrigerator or at room temperature? They look delicious! I just store them in my pantry but you could freeze them or store in the fridge no problem. Looks like a great one to try for my kiddos. I’m confused though….quinoa that’s ground up is flour. I can’t understand how these are flour-free….whether you grind it up or the store does, ground up grain is flour. ??? Yes, but the body will still process it as a flour…I have heard Chef AJ say Chickpea flour is still flour and she doesn’t recommend it. Not trying to be annoying, just realistic about it for people that might truly be sensitive to the “addictive” power of any flours (and the sharper spike in blood sugar they cause). I know Chef AJ doesn’t recommend buckwheat, or bean, or millet pasta either, and those are also all either pseudograins or legumes….? I would be more inclined to say these muffins are definitely nutritious, but not actually in line with Chef AJ’s “no flour” policy. Yes, it seems there is a spectrum of food addicts. I am not in UWL but have eaten an MWL style McDougall diet for 10 years. I’ve watched almost all of Chef AJs videos, eat low fat, whole plant foods and sos free for several years now. I definitely agree everybody chooses flour/no flour for themselves. I actually find a lot of the recipes on the UWL book odd because I would not consider several of them low calorie density. I know JP has similar thoughts. 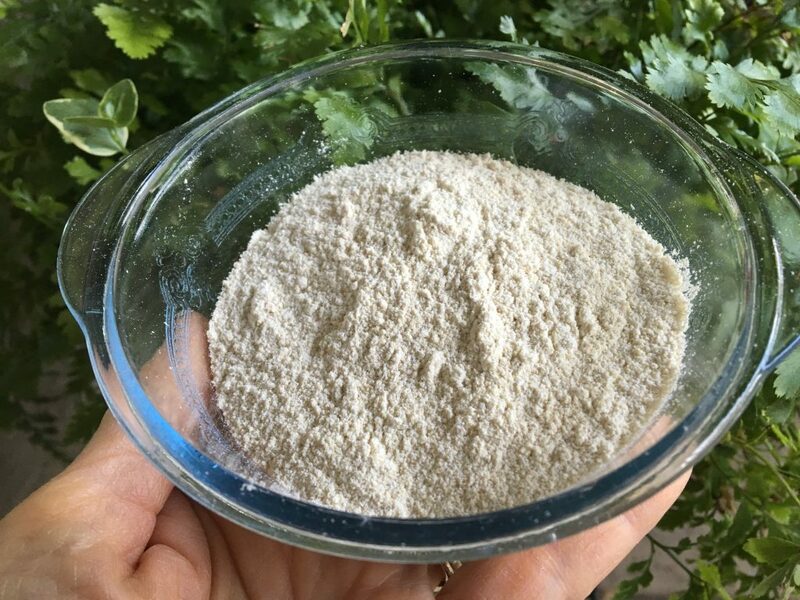 No problem with saying some people can have ground grains, but the “no chickpea flour” but some “millet flour” seems confusing…John McDougal has talked about all ground grains spiking insulin more and being good for weight gain. In fact, at one point, I wanted to gain weight and he and Esselstyn both responded to my questions and recommended whole grain flour products. Anyway, not looking to be a pain. Just confused about this aspect of UWL. Again though, I agree it doesn’t matter in a way…one person can choose to use it, another cannot. I have a lot of plant based nutrition knowledge from years of researching and figuring out plant based living for my family and kids. I can make an educated choice for myself…I wonder more about people who think they are eating “perfectly” and are doing everything possible to master food addiction and lose weight, and meanwhile, they are eating ground grain products that are calorically dense because they have been assured it is UWL compliant….might be, but it’s not calorically dilute, and it might trigger overeating. 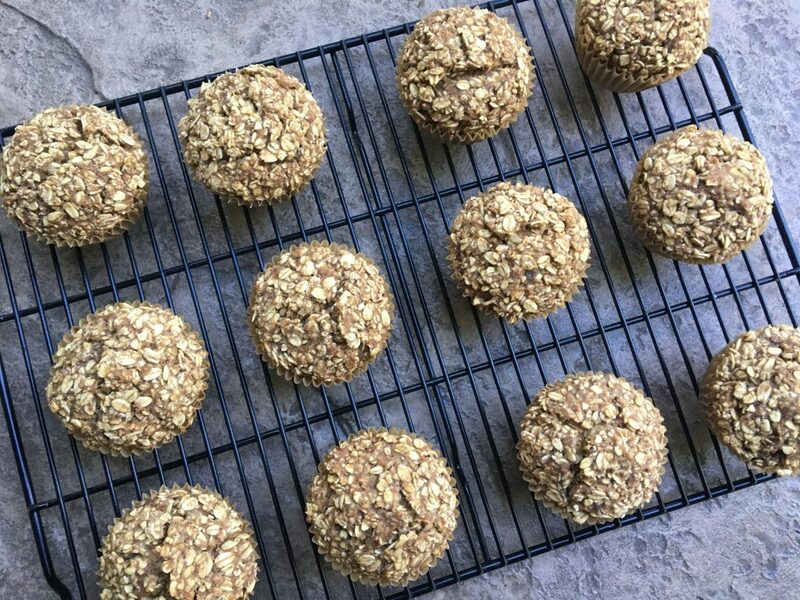 I know my husband is working at losing weight and if he eats and ground grains (or even two ingredient banana oat cookies) that are more calorically dense, he gains or stays overweight. The recipe looks perfect for my kids who can use lots of calorically dense, delicious, whole food calories though! I am a member of the UWL group and in Chef AJ’s Mastery program as a mentor and I am just following her guidelines. So for those of us who are in her program and following her guidelines these muffins are considered compliant. What you do on the McDougall program or what you or your husband need to do is an individual thing. If you were a member of the UWL group Chef AJ would tell you that if you can eat these muffins and not overeat on them and they don’t cause you to have cravings then enjoy them. If not then don’t make them. Of course, you could always argue because he says “whole grain” and quinoa is a “pseudo-grain”, that his principle wouldn’t apply to the quinoa flour…but I think it is likely that the body processes whole wheat, or buckwheat, or oat, or corn, or quinoa flour in a similar way. And, one could always ask Dr. McDougall’s opinion. The texture of these muffins is great! Just had a fresh one, with a dab of raw almond butter and date syrup. For my taste, next time I may omit the cardamom and just use more nutmeg. Have you tried with ground millet, instead of quinoa? Do you know how much you pay for the organic 25lb oats? I am so glad you like the muffins. I haven’t tried them with ground millet. A different muffin recipe that I made that had ground millet in it we didn’t like the texture of them – the millet was kind of grainy. Just personal preference. I don’t know how much the 25 pound bag of oats is. We need to go buy another one soon! Happy Cooking! These look great but just wondering if you think you can use additional old fashioned oats in place of quick cooking steel cut oats. Thanks! Hi Emily, give the old fashioned oats a try and see how it works! Tami, this is another awesome video! I just love your videos and how you explain everything so well. These look fabulous, and I’m anxious to make them! Thank you so much for all the time and effort you put in to sharing your recipes and videos with all of us! That is very nice of you – thank you for the kind comments. Happy Cooking! Thanks for the recipe. I’m making these today. They look delicious. Hi Tami, this recipe looks amazing! What size are the containers that you use for the pre-made mix? Thank you! Hi Patty they are 4 cup containers! I have a dozen of these in my Breville Smart Oven Air right now. They are browning nicely, just they way I like them. I’m giving some of them away tomorrow, which helps me with portion control! I made a container of dry ingredients for my batch too – great tips, Tami! 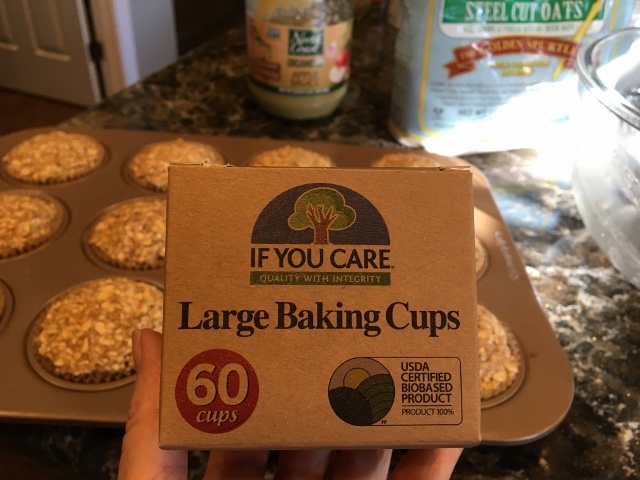 I also appreciate your suggestion to use a half-cup measure to fill the muffin cups – it works perfectly! 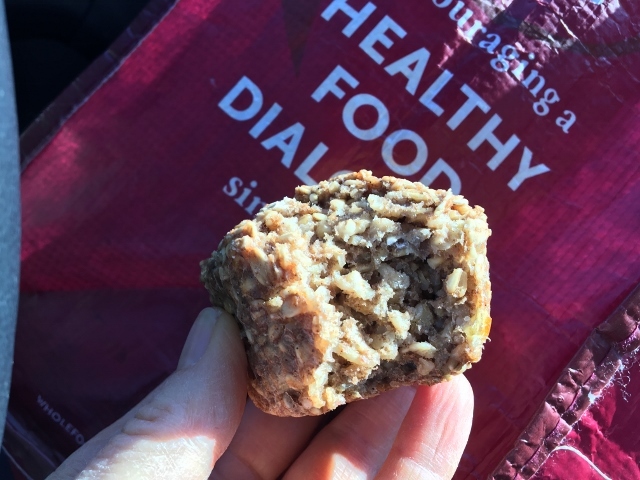 Thank you for all the feedback Colleen – we love these muffins too! Having the batch prepped mixes ready to go is such a time saver. I am so glad you are doing it too. You are so awesome with your batch prepping. Wishing you a wonderful New Year! Hope to see you in Vegas this year. Thanks for sharing this recipe and where to purchase all the products. I enjoy watching all your presentations! You are a gifted cook and teacher. That is very kind of you to say Jan! I am so glad you like the recipes and videos. FINALLY going to make these as they have been on my list forever! My only concern is that those Quick Cooking Steel Cut oats are not (certified) gluten free. I may sub my gluten free (regular) steel cut oats in and see what happens. I am “assuming” the “quick cooking” part means they are smaller in size – so maybe a quick pulse in the food processor to shorten the oats I have will help? I’ll let you know! Thanks again for all your great posts and recipes. Keep inspiring people Tami! Will regular steel cut oats work instead of quick cooking? These look so good! Thanks! What a couple people have told me they have done is to put regular steel cut oats in their food processor and using the pulse function they cut the regular steel cut oats up a bit and then they work in this recipe. The quick cooking steel cut oats are just cut smaller which makes them cook faster. Hope that helps. These are such good muffins – enjoy! I make several pre-mixed dry ingredients batches and keep them in the freezer. For those who don’t have quinoa on hand, I replace the ground quinoa with ground oatmeal and the muffins still come out great. Another hint. I sometimes sdon’t moly flatten these into cookies and love them this way, as well. Using the same amount of cooking time they come out a little crunchy which my husband enjoys!Thanks, Tami!! Thank you for sharing all your tips and hints. It’s great to have those here for others to read! I am so glad you like them as muffins and as cookies. Crunchy cookies sounds good to me!